Use equal volume of soaked rice and liquid. When you use more liquid seasoning (like soy sauce), make sure to adjust the amount of water. Wash the rice in a large bowl several times. Soak the rice in water for 30 - 60 minutes. Discard the water. Put the rice in a medium pot if you cook on the stove; or in a rice cooker bowl. Add all the liquid and salt and combine well. Clean the dried kelp with a damp towel and add it into the pot or rice cooker bowl. 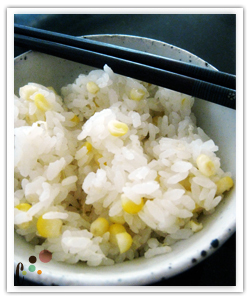 Put the corn kernels on top of the rice. Do not mix. If you use a rice cooker, cook the rice by following the manufacture's instructions. When it's done, fluff the rice with a spatula very gently. If you use a stove top cooking method, follow the instruction below. Cover the pot and bring it to a boil using high heat (2-5 minutes). You will see white foam around the cover. Turn the heat down to medium-low and cook for exactly five minutes. Turn the heat down to very low and cook for five minutes more. Turn off the heat and put a kitchen towel between the cover and the pot and leave it another 10 minutes. Remove the kelp from the pan and fluff the rice with a spatula very gently.